A new free bus service has been launched in the St. Augustine area, by the St. Augustine Education City, under the Ministry of Tertiary Education and Skills Training. The brightly branded bus, called the Hop-a-Bus is the first CNG powered bus being run by the PTSC. The bus officially started working today and it will run from the Eric Williams Medical Sciences Complex to St. John’s Road in St. Augustine. It will run every 55 minutes in the first phase. There are over 25 stops in this first phase. The Hop-a-Bus works from 6 in the morning to 9 at night, Monday to Saturday. All students, tertiary, secondary and primary school will travel for free, as well as the elderly. Other members of the public can access the bus for three dollars. Additional buses and routes will be added. The St. Augustine was officially made the country’s first education city in 2011 by Cabinet. 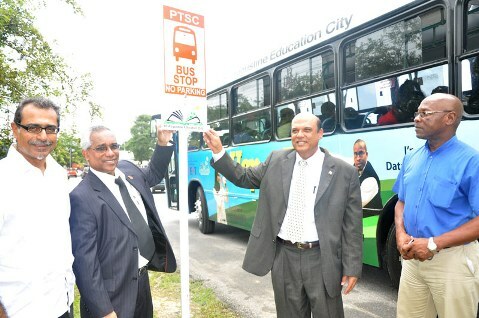 Minister of Tertiary Education and Skills Training Fazal Karim revealed at the launch of the new bus service today that in the last two years, tax payers have spent $540 million on GATE for schools in the St. Augustine area alone. For the members of the Education City Committee,transport and security are seen as two major areas of focus. Improving the pedestrainisation of the area and boosting the CCTV infrastructure is being undertaken as well. Currently the University of the West Indies has one hundred CCTV cameras, but it has a capacity of 1000 cameras and these will be networked with the Ministry of National Security. Today at the launch of the Hop-a-Bus the Minister of Tertiary Education and Skills Training Fazal Karim announced that government is moving towards establishing other education cities throughout the country, including Chaguanas and Tobago. Minister Karim also announced universal tertiary education is also being given consideration.